Okay, Rhonda’s Finish Along is fab for making me keep track of things over a longer period, but I actually have things to do that aren’t on that list too, you know, new things that I also have to do as well o.O Anyway, I saw Traceyjay’s Three For April popping up, and decided that it was a good thing to keep track of just this month’s ‘To Do’ list, or at least the 3 most important things! 1st up is my Stained Quilt. This is my granny’s birthday pressie for early May, so I’d best get to it! I’m just doing a solid back from a flannelette sheet that’s in the wash right now, and I’m going to take it over to my gran’s on Monday to use her big floor space to baste it on. I’m planning on some wavy organic line quilting, to kind of go with the swirls and circles in the fabric, what do you think? How about the rest of you, any of you joining in? Great idea! Haven't seen this Katy and as you say we need to keep track of new too! Get those done girl – they are so worth finishing off! I'm going to try and get some of your paper piecing lessons done, this weekend, but I'm not promising anything else! I like the idea of wavy line quilting, I keep meaning to try this myself so thanks for reminding me as I have a quilt to baste too over the weekend! Looking forward to seeing what you make for the sample swap and both of these lovely projects finished. Is there show and tell at the guild meetings? This Stained quilt looks fantastic! I'm sure granny will love it. Hope you're gonna blog about it and show some close up photos. Your poor cushion is getting a complex. It is funny how we get a block about something and put it off. I really know the feeling. must say sweetie, loving the streamlined clean new blog look! How on earth do you get all your buttons the same size??? The Stained Glass quilt is beautiful and I love the idea of contrasting all the rectangles with wavy quilting. Good luck on your cushion this weekend! Sometimes the smallest projects give me the most resistance! 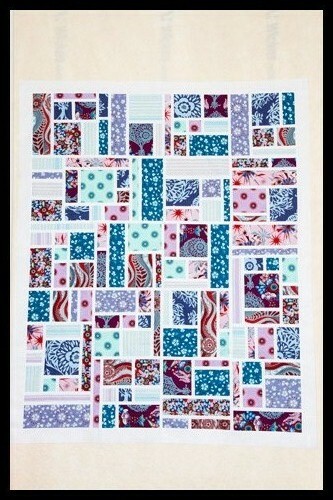 I think the wavy lines would look great… it's a beautiful quilt! Amazing windmill block too! Thank you for linking up! I look forward to seeing your report at the end of the month! I think they are feasible 'to do's! The Stained is amazing and I think the wavy lines sound perfect. I think the organic wavy lines will look perfect on the quilt. 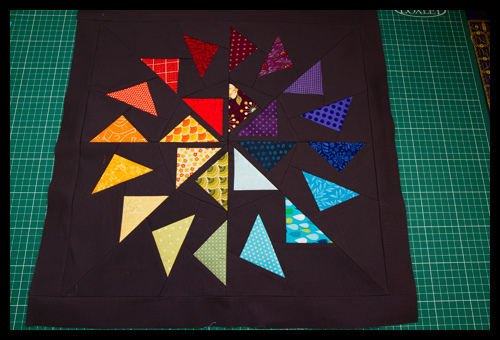 Will help to break up the stained glass effect to, making a beautifully balanced quilt. Your granny's a lucky girl! I think it's very wise to stick with three. Right now, I can't manage more than one! Yes, organic lines! And that is going to be one beautiful cushion! I can't wait to see the finished Stained Quilt!